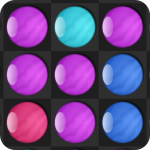 Select 2 or more adjacent bubbles with the same color and pop them.With hundreds of levels and puzzle challenges. You can share your scores and achievements with your friends. The more bubbles burst highest ranked.features:-Bulb button: this button allows you to completely solve the level. It shows the group of bubbles you must exploit every time.